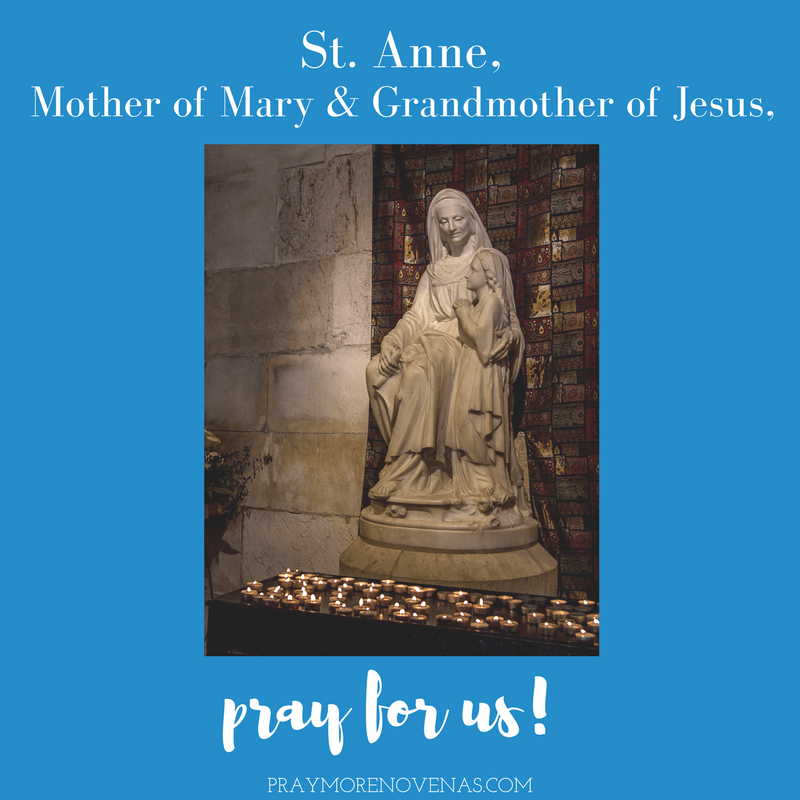 Here’s Day 8 of The St. Anne Novena! Blessed St Anne and St Joachim l pray that it would be possible that Steph and Peter could conceive a healthy child before it is too late. Make stronger in my situation. Bless all my family. In the name of the father. Amen. Bless my husband that he may regain interest and humour. Bless all my family and keep them safe. In the name of the father. Amen. Both need love and protection, both are scared of thunder storms, and unhappy pets. May God have grace of the small, large, and sick. Good St. Anne if it be the will of God that I should one day be a grandmother please intercede on the behalf of my children to deliver healthy children. My sister needs help with her nerves and medical problems. Please St. Anne help her. Thank you dear sweet lady. Jean must swallow her tablets properly. O good Saint Anne, please ask Jesus, your grandson, to help my wife and I reconcile our marriage to the image that Christ has for all married couples. Help us to love each other unconditionally, and to fully trust and honor each other. I ask this in Jesus’ name. Amen. Please pray I might be healed of my physical pain if it be God’s will for me. I ask prayers for an ablation I will have on the 31st July be successful. For all the sick that they find comfort in the Lord and persevere in joining their cross with-our Lord. Amen 🙏. Pray for me St. Anne. St Anne please pray for me and my spouse. We have been trying to conceive for more than a decade. I know that God will hear us with the help of your intercession. prayers to mend and strengthen my daughter’s relationship with me. Prayers if thanksgiving for my mother’s health. Please intercede for my family. I pray that we qualify for and receive the disability benefits for my son. That we may provide better for our family’s needs, that my husband my have the funds to pay for his final course to finally finish his apprenticeship and better provide for our large family. This money would help us pay off our debts and keep up with our tithing. Please also pray for me that I be a good mom and home educator. Blessings upon our home school. Thank you dear St. Anna! Please pray for my son inlaw who has MS and is having difficulty with numbness and cognitive issues. The Dr are trying to get him on a new treatment but the insurance company is not cooperating. Please pray also for my daughter as she care for him….St Anne pray for us. Please St. Anne indpire my Daughter and living a more healthy life and losing weight. As well, intercede in my daughter meeting the husband and son meeting the wife of their dream. Please hears our prayers, for my husband I to conceive and have a healthy pregnancy. I had 2 miscarriages last year, but I know that God can turn things around so we have a successful pregnancy and birth. My elder sister has just been diagnosed with Cancer of the pelvis and abdomen. Please intercede for her healing and bring her closer to God. Please be with my mom and help her stay calm and trust fully in God, she is so worried about my sister. Please hear our prayers, Amen! St.Anne I am praying for my sister,Jen who will be going for right eye operation on 27 july 2018….Pray that everything goes on smoothly….Pray for my brother S in his health to improve…… Pray for G in her health & work…..Pray for my constipation problem…..
Interecede Dear St. Anne: For my nephew and his new wife to have a strong, holy, healthy and happy marriage and they will return to the Catholic Church/Faith. Pray their future children will be happy, healthy, normal, and CD pregnancies will be smooth, and an easy and safe delivery. Pray for 104 year old Gee to be covered with peace and calm through the Power of the Holy Spirit. Pray Jerry and I will be able to have smooth remodeling projects done without a lot of arguing. Please bring C and I back together In a happy, healthy loving relationship. Marriage, family, faith and love. I pray that my children who were conceived and born after many years of infertility come to accept Jesus as their Savior and God as their Heavenly Father. Open their hearts. I pray for healing of my eldest’s heart as it was shattered by his ex girlfriend. I pray that she misses him and regrets her actions in misery. I pray for safety and common sense for my daughter. I pray for my youngest to grow in physical stature. I pray for peace for my mother and brothers as we continue to deal with the passing of my father. Most patient mother of the Blessed Virgin Mary. Thank you for your intersession as I pray for God’s people. May all souls come back to the faith and seek a meaningful existence in this lifetime. Many people are suffering, esp. families when there is a feeling of rejection, abandonment, lack of understanding is the most painful suffering. I pray for my sister, Brenda for rejecting me for reasons beyond me. May your intercession St. Anne bring my baby sister to a better understanding towards me, and let go of all the negative feelings towards me. It’s already four years since her silence towards me. I’ve tried everything to gain her friendship and felt used. Jesus I trust in you. Heal Brenda ‘s Heart dear Lord. I’m mostly concerned about my sister’s soul. May a positive force come about and the Holy Spirit whisper positive thoughts in Brenda’s ear as she sleeps. Heal my sister completely, in Jesus Holy Name. Pray for my friend Rose to come back to the faith and ask God’s forgiveness, and to let go of the Anger towards the Catholic Church. Pray for Rose’s boys and her grandchildren. I pray for Mercy for everyone in this world and that the burdens would become lighter, b/c the faith has deepen. Place all my concerns on the cross, b/c I’ve picked up my cross and placed all my trust In Jesus , our Savior of the World. I pray for the young mothers to have a hunger for the word of God, so that they will pass the Catholic teachings and traditions to their children. Jesus, I trust in you. Praying for my own personal financial issues, and may God’ s divine wisdom give us the knowledge to do what is right always. I pray for my husband to be hungry to seek Divine knowledge and Wisdom. and we have a better understanding towards each other. I pray to St. Joseph to look after my husband and myself to fine a job. I pray for Fr. Ravi and all the priest in my local church. I pray for the protection of the Catholic faith and it’s teachings throughout the entire world. Protect all our priest most blessed St. Anne in these trying times. Pray for Joseph , my nephew, may his faith deepens in these trying times for him. May Joseph’s problems be resolved in God’s time. Jesus, Mary and Joseph save souls. Lord Jesus I place my financial needs into your hands.lord Jesus. Blessed mother I place my son into your hands. I pray for money to pay my son’s tuition fees which is now due .Lord I pray foe financial deliverance.